I ordered up a Bluetooth radio with CD from Crutchfield. If you have done business with them you know they give you all the parts to fit the dash and cables to hook up to the vehicle wiring. The only problem I ran into was that the wiring harness I for with the kit from Crutchfield said to match up the wiring to the new radio harness & splice together noting that the color of the wires may not match so match the function of the wires. The issue was that the book that came with the radio didn't have all the functions listed nicely as the cable harness to connect to the vehicle. After some deduction I figured it out & spliced the wires. 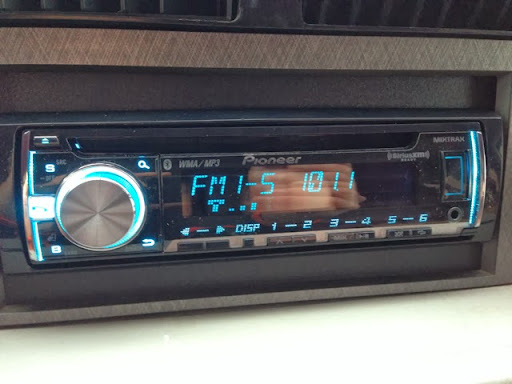 During install of the new radio I was hoping that the amp would work & it did. With install complete the Bluetooth radio is ready for the trip.